Out of War draws on Mariane C. Ferme’s three decades of ethnographic engagements to examine the physical and psychological aftereffects of the harms of Sierra Leone's civil war. Ferme analyzes the relationship between violence, trauma, and the political imagination, focusing on “war times”—the different qualities of temporality arising from war. She considers the persistence of precolonial and colonial figures of sovereignty re-elaborated in the context of war, and the circulation of rumors and neologisms that freeze in time collective anxieties linked to particular phases of the conflict (or “chronotopes”). Beyond the expected traumas of war, Ferme explores the breaks in the intergenerational transmission of farming and hunting techniques, and the lethal effects of remembering experienced traumas and forgetting local knowledge. In the context of massive population displacements and humanitarian interventions, this ethnography traces strategies of survival and material dwelling, and the juridical creation of new figures of victimhood, where colonial and postcolonial legacies are reinscribed in neoliberal projects of decentralization and individuation. 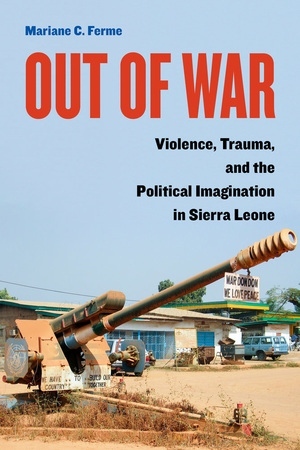 Mariane C. Ferme is Professor of Anthropology at the University of California, Berkeley, and the author of The Underneath of Things: Violence, History, and the Everyday in Sierra Leone.